Now that the dust has finally settled after Prof Noakes’ victory in the HPCSA enquiry we can return to business as usual and focus on our chief objective of working towards helping people live healthier, happier lives through proper nutrition. An issue that keeps coming up, and one that we need to address, is the undue influence of industry on our dietary habits. We have to ask ourselves whether certain bodies who regulate and enforce the prescribed dietary guidelines can ever be truly independent when their paychecks come from industries which are geared towards creating customers. How can dietitians who consult for big industry be trusted not to push the industries agenda? As consumers, we need to take responsibility and educate ourselves about where our information is coming from. 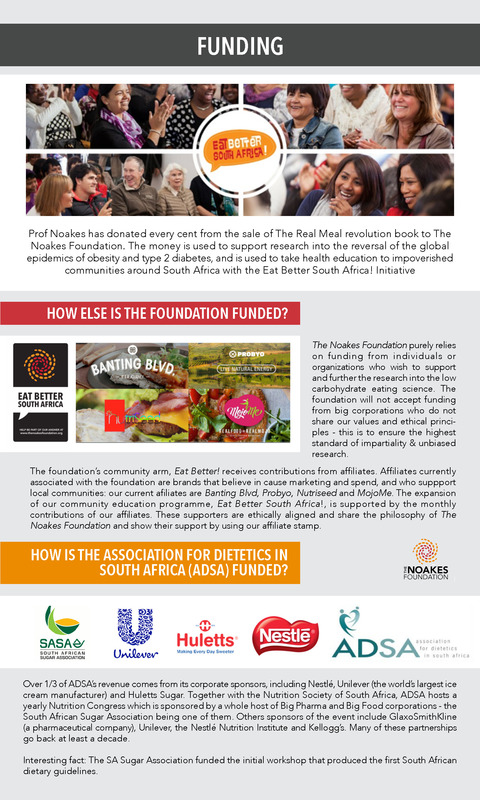 The Noakes Foundation is a registered Public Benefit Organization – we purely rely on funding to do our research. We will never accept funding from people or industries who do not share our values and principles, ensuring we maintain the utmost level of independence and impartiality.